So something funny happened: Video games and language collided once again. I’ve mentioned before on this blog the video game Street Fighter II, that quarter-eating staple of middle school birthday parties that created a genre out of two people from different countries knocking the crap out of each other. Back in the days of the original Street Fighter II — that is, not one of the quasi-sequel modifications that inserted words like “turbo” and “super” and “championship edition” into the title — the game had eight playable characters and four non-playable bosses. Throughout all incarnations of the series, Ryu — your typical wandering Japanese karate practitioner — is the main character and one of his mistranslated quotes ended up making fans of the game think Street Fighter II featured a secret character. “You must defeat Sheng Long to stand a chance.” This was Ryu’s pronouncement over fallen opponents. What he meant by this isn’t clear, at least when it’s spoken in English. In the original Japanese, he’s actually saying “If you cannot break through the Rising Dragon Punch, you cannot win!” That “Rising Dragon” — in Japanese sho ryu — became translated into Chinese pinyin as sheng long. Not knowing what this mysterious “sheng long” referred to, American players assumed it was a proper name. In actuality, the phrase referred to Ryu’s signature move: a jumping uppercut that was useful for coldcocking both standing and airborne challengers alike. The rumor of Shen Long’s existence became widespread enough those who frequented arcades that a then-widely read video game magazine, Electronic Gaming Monthly, pulled off a fairly successful April Fool’s joke involving the supposed character in 1992. According to a supposed tip from a reader named W.A. 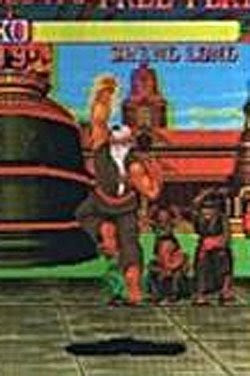 Stokins, Shen Long — a character purported to be the karate sensei of series protagonist Ryu as well as of Ryu’s American rival, Ken — could be fought in Street Fighter II, but only if players met some next-to-impossible conditions: play as Ryu, don’t take a single hit over the course of the game, and then face off with the game’s final boss but let the timer run out without landing a single hit against him. 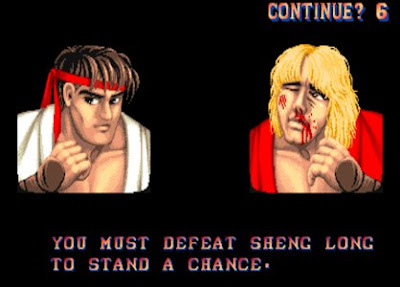 If successful, EGM explained, Sheng Long himself would emerge, dispatch the boss and then face off with Ryu in what would be the fight of his life. More than just being an optional, alternate boss, Sheng Long was proposed to be the guy to beat. Not only could he pull of the special moves of any of the game’s characters, these techniques hit harder when performed by Sheng Long. He was faster, too, and — what’s more — his even mightier version of Ryu’s Rising Dragon, which sent fists rising up not only triumphantly but also with the added benefit of being on fire. W.A. Stokins’s tip was fake, as it would be learned by EGM readers who received the following month’s issue as well as anyone who actually managed to pull off the proposed challenge. (If his name wasn’t indication enough, his location was listed as Fuldigan, HA, which should at least have been conspicuous for looking like an obvious typo.) That didn’t stop the arcade monkeys from trying their best anyway, nor did it prevent the supposed tip from resurfacing in other video game magazines across the country. hoax and prototype. it can be both. why shouldn’t it? In the meantime, the character of Ryu and Ken’s master started appearing in Japanese comic book adaptations of Street Fighter, only under the name Gouken (which translates into English as “strong fist.”) The series was non-canological, of course, but that didn’t stop traces of this unseen character from creeping into the actual series. In the third quasi-sequel modification to the original Street Fighter II, Ken’s version of the Dragon Punch set his fist ablaze in a manner that looked a lot like EGM’s mock-up of Sheng Long. And in Street Fighter Alpha, a series that served as a prequel to Street Fighter II, Ken sported a ponytail, making him look even more like Sheng Long. Strange, when you think about it. In the fourth quasi-sequel modification to Street Fighter II — its title, in full, was Super Street Fighter II Turbo — there existed an actual optional boss: Akuma, an insane brother of Gouken’s who used his martial arts prowess for evil purposes. (In Japan, Akuma’s name is “Gouki,” which translates to “strong spirit” or “strong demon.”) The conditions for fighting Akuma were far less difficult to achieve than W.A. Stokins proposed for meeting Sheng Long, but they required a certain level of skill. Also, just as Sheng Long was supposed to have interrupted the final boss fight and face-off with the player’s character himself, so to did Akuma. 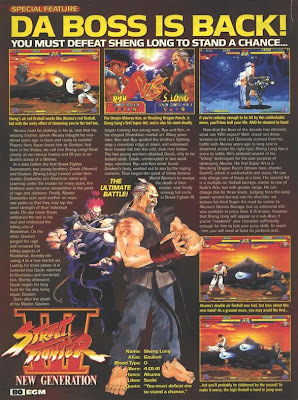 In its 200th issue retrospective, EGM noted the similarities between their prank and Akuma’s M.O. According to Shen Long’s Wikipedia page, Capcom has never confirmed nor denied connections between the fake character and Akuma. Later, Akuma became a playable character and his ending sequence featured an image of both Gouken and an even older sensei — Goutetsu, the man who taught Akuma and Gouken. Capcom themselves repeated the joke a third time on April 1 of this year by hinting on its official site that Sheng Long would appear in Street Fighter IV. On April 2, they owned up to the joke but received some criticism for it anyway. I wonder if fans’ harsh reaction to the most recent Sheng Long hoax was lessened somewhat by the news that came out of Japan late September: Ryu and Ken’s master would, in fact make appear as a fighter in Street Fighter IV. Finally. I’m sure Capcom had to clarify this point with a promise of “no joking” more than once. 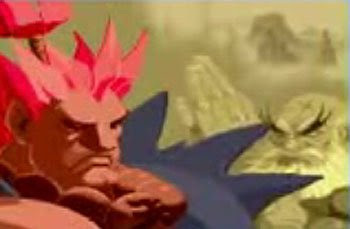 A sidenote before finishing: So why did Capcom use “Akuma” for the Western version of the Street Fighter games, anyway? “Gouki” is hardly more understandable to the Japanese-illiterate than “Akuma.” Ever since I learned Akuma’s Japanese name, I wondered if the switch might have been motivated by the fact that “Gouki” sounds a bit like a certain slur against Asian people. In fact, “Gouki” sounds a lot like an adjectival version of that word. Just a random thought. So that’s my exploration of this one small part of a video game series that most people my age have largely forgotten about. I enjoy that a translation error resulted in a rumor that ended up being perpetuated for more than sixteen years and which also may have also influenced the original product itself. 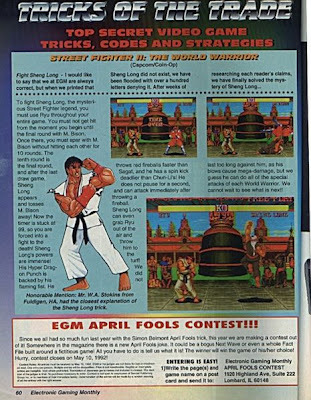 Maybe an April Fool’s Day prank by some American guys working at a video game magazine did eventually become realized halfway across the world. That seems remarkable enough to merit a blog entry — though maybe not one this long. I doubt anyone would have guessed people would have any reason to mention W.A. Stokins today. It's an interesting point on the Gouki/Akuma name switch, but I'm not sure I agree with you logic as to why it happened. Capcom is less prudish than you think. There’s a character in the Final Fight series, which is like a sister series to Street Fighter (characters cross over, etc.) and his name is Sodom. In early American versions of the game, they call him Katana, but they have since gone back to the original name. So it seems like they’re willing to risk offending a few people for the sake of keeping the name correct. Anonymous: Yes, I suppose I should have remembered Sodom, whose name is roughly as offensive as a racial slur, depending on who's being offended. More recently, just about every other name switch can be explained, however, save for Akuma/Gouki. "Gouki" wouldn't sound like a racial slur, because it's using an incorrect form of the long "o" that's been popularized. It's the form of Romaji a lot of Westerners learn (I can't remember the name of the system to save my life), and it's pretty harmful to pronunciation as we would assume the 'ou' would be pronounced 'oh-ooh".. but it's actually just "ohh". Gōki is more accurate as it would be pronounced "goh-oh-key". or "gohhkey". I though translators though that Gouki didn't sound evil enough..
this rumor is old like me, in my time as a STT2 player this secret character was the dream of all boys in my time, so many times I try to obtain this character and nothing, and now I heard about this character in ST4, maybe this time finally we can play with him. Well, thanks for the comment. So are you not a spam robot? I'm just curious. This is one of the few comments I've ever gotten that would appear to be shilling for a Viagra supplier but which also seems to have been written by someone who read the post. Are you getting paid the post comments that link to this website? I'm not the spammer, but I wanted to thank you for this post. I'm a Japanese-English translator and a de-facto specialist in video games, and I mentioned the Sheng Long foofaraw in my presentation on video game translation at a translators' conference this past April. It went over well, especially once I got into the April Fool's pranks. Thanks for the compliment. And any comment that uses the word "foofaraw" is a welcome one here. I'm curious: Were you speaking about the Sheng Long situation itself, or did you work that into a presentation about other issues? And was my blog entry of any use to you in preparing the talk?